If a child is in immediate danger, call the police on 111 within New Zealand (use the appropriate emergency number in other countries). A child can experience more than one form of abuse at a time. What can I do if I'm worried about a child? What health services are available if I'm worried about child abuse? If your child is hurt or unwell and you suspect abuse, seek help straightaway. There are a number of people and services that can help such as nurses and doctors, and social workers who work within the health system. Health social workers can help with a range of issues. They will listen to you and work with you to find support that is right for your situation. When should I seek help if my child is hurt or unwell? If your child is hurt or unwell and you suspect abuse, it is very important to seek help straightaway. If your child needs urgent help, take them straight to the emergency department of your local hospital. If you're not sure how serious the injury is, it is best to go to the hospital. The doctors and nurses there can check your child and make sure they are OK. If you don't think it's an emergency, there are a number of people who you can see. This could be a health professional such as your family doctor, school or Plunket nurse, or midwife. Who will be involved if my child has been abused? If you take your child to hospital, a health professional with special skills will see your child. They will examine your child and may do some tests. It depends on the type of harm to your child. The health professional will talk with you about everything and explain what's happening. Counselling may help the healing process for a child or young person who has been the victim of abuse. As this is a very specialised area, wherever possible, your child should see an approved counsellor who has experience in this area. Sometimes a child doesn't want to see someone immediately. They can choose to see a counsellor at a later date. Accident Compensation Corporation (ACC) provides ACC-approved counsellors for children who have been sexually abused. ACC can help with some of the costs of counselling. You can find registered counsellors by region, including ACC-approved sexual abuse counsellors, at the ACC website. You can contact your local Citizens' Advice Bureau for details of local crisis counselling services, as these differ from centre to centre. What if I'm worried about my own behaviour? If family members show fear of you, find you hard to talk to or feel they have to do what you want them to, you might need to consider changing your behaviour. Help is available. 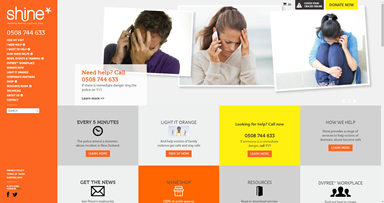 If you want help with your behaviour, call the Family Violence Information Line on 0800 456 450 to find out about the organisations in your area which can help. The content on this page has been developed and approved by the Clinical Network for Child Protection, Paediatric Society New Zealand. 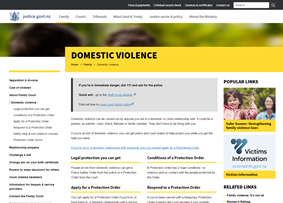 Information about what to do if you or your children are the victims of domestic violence, including information about legal protection available - including Police Safety Orders and Protection Orders. 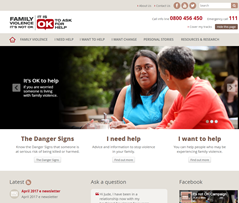 nformation about what to do if you or someone you know is affected by family violence. Includes information about Protection Orders and Police Safety Orders. 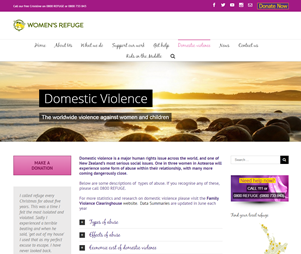 Shine provides a range of family violence services, including a comprehensive website on family violence and a toll free national helpline 0508 74 46 33.